We also offer hour long Farm Tours for £10 per adult, kids go free, but not unaccompanied. 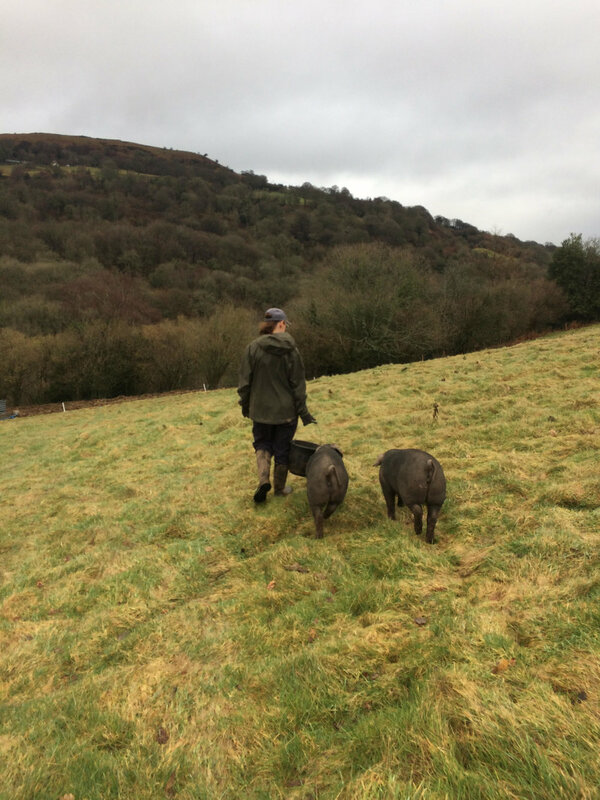 We provide bespoke courses on outdoor, high welfare pig keeping, with the emphasis on providing practical skills and the confidence to start in pig keeping and farm management. . We can provide day courses for one person, couples, and families. So whether you would like to dip your toe in the water and find out if pig keeping could be for you and your family, or if you are already a pig keeper and want to learn more about the technical side of pig keeping, such as medicines, protein to lysine ratios, or even how to butcher a pig, we will tailor make a day just for you. Having set up our farm recently, we can advise you on how to efficiently manage your farm and turn it into a profitable business. Learn from our mistakes- as newcomers to farming we can share lots of tips that will save you money and make your pig keeping experience more enjoyable, and a little less hard work. If you would like to book a place, please get in touch. Once you you have contacted us we will discuss what skills you would like to learn and make efficient use of your time. We have 20 sows and always have a bunch of piglets on the ground and everything else in between so there's always plenty to do ! We provide days courses for individuals, couples, and families so that the days experience can be tailored to you. We also have gift vouchers available and a day's pig keeping course can make an interesting and different gift, whether it's a person who is interested in becoming a farmer, a foodie, or a pig enthusiast. • How to move and load pigs the easy way ! We have our own cutting room where we butcher our pork. We make sausages and home-smoke our own bacon too. We can teach you how to process a pig from a whole carcass down to pork chops and joints. We can have a go making sausages too, and advise on how to smoke bacon. Less intensive than the Pig Keeping Course, this is a chance to have fun playing farmer for a day, feeding, strawing up, and getting stuck in on the farm. Suitable for all ages. A day for animal lovers, sit with the pigs, play and pet the pigs - they love a good scratch! A chance to really observe pig behaviours, have fun, and enjoy being in the fresh air with these sweet companions. Suitable for all ages. Come and visit the farm, see the cute little piglets and the big sows, collect eggs from the chicken coop and enjoy a little of farm life.